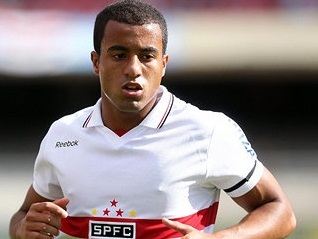 Manchester United are trying to sign Sao Paulo’s Lucas Moura whilst Chelsea have their eyes on Internacionale’s Oscar. Sao Paolo are demanding £34 million for Manchester United target Lucas Moura, according to the Daily Mail. The 19-year-old has been watched by United scouts for months now and Sir Alex Ferguson desperately wants to add the teenager to his squad to boost his attacking options. The player has a contractual agreement in which he will be paid 20% of any transfer fee to his name, therefore Sao Paolo want to hike up the price to benefit themselves further. And of course, Moura won’t mind as every penny more that United pay for his services is a penny more that he will receive as part of the deal. Lucas Moura doesn’t fit the bill for Manchester United, according to Tom Webber. Giovanni Luigi, president of Brazilian side Internacionale, has admitted that Oscar may be sold this transfer window, with Chelsea looking hot favourites to take the Brazilian. Chelsea are thought to have made a bid of around £20 million, but sources indicate that bid was rejected and the Brazilian outfit are holding out for a substantial figure more. “If an offer that matches our expectations arrives, we will logically negotiate Oscar’s sale,” Luigi told Radio Gaucha. “But it must be an offer which represents a substantial boost to Internacional’s financial resources. The biggest transfer in Brazilian history is that of Denilson, who moved from Sao Paolo to Spanish club Betis in 1998 for £25.9 million.